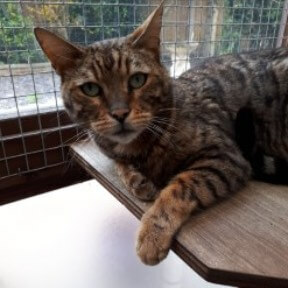 We’re really happy that you’re thinking about adopting a cat from Bristol & Wales Cat Rescue. We want to make sure we find the purr-fect feline for your family. Our priority is finding safe and loving homes for cats that often have not had the best start. The welfare of our cats comes first and foremost, which is why we follow quite a strict adoption process. You’ll probably find that we’re more flexible than other rehoming charities as we try our best to find each family a cat that will work with your lifestyle. We do have a few rules, especially for our young kittens, to make sure all of our felines have the chance to thrive and minimise the chance of unsuccessful adoptions. We’ve put together some guidance from our most common queries. If you have a question and can’t find the answer here, please don’t hesitate to get in touch and we’ll get back to you as soon as possible. We do not turn away potential families for a lack of outside space. We have a number of cats who don’t go outside for various reasons – some medical, some have no road sense, and some have just never shown the interest – all of which would be perfectly happy enjoying a long sunbathe on a comfy sofa instead. Most of our felines are lovers of the great outdoors, and so we don’t place these as indoor cats. You can see if a cat is suitable for indoor life on their profile. We will not re-home kittens as indoor only. It’s impossible to tell how a cat’s nature will change which means it’s unfair to home a potentially outdoor loving puss without room to roam. Unfortunately, this can lead to stress, behavioural issues and an unhappy family. You don’t need to have a cat flap to adopt from Bristol & Wales Cat Rescue. We will take this into consideration, as well as other factors, when matching you with potential cats for your family. For example, an active cat who likes to wander will be just as happy in home a where there’s someone nearby to open a window or door! We generally don’t rule out any family due to work/time commitments. Unlike other pets, a lot of cats are happy to sleep the day away on a warm windowsill and perk up just in time for you to deliver dinner. We work with our families to find the right cat for them. Some of our cats have special requirements, and some are just divas who like a lot of attention, most can fit into full-time work and school life nicely. Our young kittens are slightly different. They need company, either human or feline, to become normal, well-socialised adults. For this reason, we don’t allow adoptions of single kittens under 14-16 weeks, but still won’t rule you out if you are away for long hours. We would recommend that when adopting kittens into your home, it’s best to have a little time off to help them settle in to your family life. 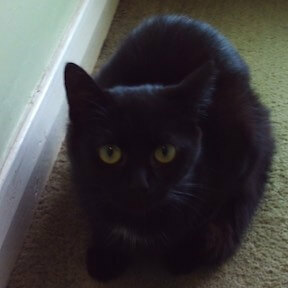 We are more than happy to allow adoptions from families with children, however it will affect which cats are suitable. 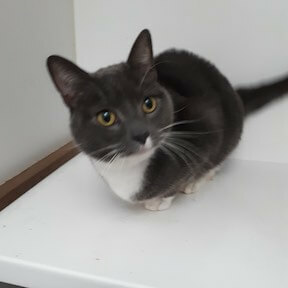 Most of our cats have experienced some trauma and all will be stressed to some extent as they’ve recently lost their homes through no fault of their own. This means that most of our cats need a lot of patience to really come out of their shells, and become the loving cats we know they are. Each of our cats will say on its profile whether or not it is suitable for life with children. They have been assessed by our knowledgable volunteer rescuers and fosterers, and we do not make exceptions to this rule. No matter how well behaved a child is, we can’t guarantee the same from a stressed-out puss. Unfortunately we’ve had too many adopted cats returned to us over the years for this reason. Living near a busy road is the biggest danger to pet cats, and so it’s one of the biggest considerations we need to make when assessing our adoptive families. We don’t rule anyone out just on location, but need to make sure the needs of the cat are met. A mid-terrace on a main road could be a cat disaster out the front, however they often make lovely housed-in runs of gardens out the back which are cat heaven! Indoor cats are also an option if it’s not possible for the cat to go outside safely. Unfortunately, there are some instances where we cannot allow adoptions due to the danger of a busy road. One of the trickiest environments are where front doors open directly onto a pavement. Cats can become incredibly stressed with no shelter or protection from the road, which can lead to running erratically into traffic. Our adoption fees go towards covering our ever-growing vet bill. From neutering and spaying, chips and vaccinations through to the complex needs of some of our older or most neglected cats. It also goes towards the cost of fostering up to one hundred animals at a time, and that’s a lot of litter! The 2016 minimum adoption fee is £60 per cat and £50 per kitten. We’re very grateful for anything given above and beyond this amount. We’d love all of our adoptees and supporters to consider a small, monthly donation – this allows us to plan for the future and help more cats in need. Our application process is really simple, you can either complete our online application form or we can arrange a call to go through the questions. This will include what facilities you have, such as outside space, and your household, including children and their ages. From this moment we’ll already be thinking about which puss is perfect for you! One of our volunteer home checkers will pop round at a time that’s convenient for you. The objective of the home check is to ensure your application form is accurate and to get a feel for what cats will work best for your family. We’re not there to judge you or your lifestyle, and would like a friendly chat about adding a cat into your family. Once approved, we’ll try to send you a few felines we think would make a good fit. 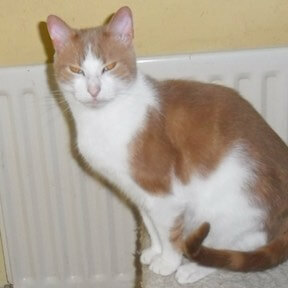 You can also view the cats on our website and follow us on Facebook. When you spot a cat you like, get in touch to arrange a meeting. When you’ve spotted a cat that we both think meets your needs, we’ll arrange a meeting in the foster home. Our fosterer will let you know a little more about the puss and if you fall in love, you can even take them home there and then. Ready to adopt a cat?